Thermal imaging camera technology has dramatically progressed since the first prototypes in 1992. What were initially expensive, bulky, weighty and temperamental pieces of equipment have evolved into essential tools that are small, lightweight and affordable. Originally developed by the military for use in combat it was once an expensive technology with limited application in civilian situations. However, technological advancements have meant that these cameras now serve many other useful purposes but none is more suited than within the fire services. Scott Safety is one of the leading experts and innovators in developments of thermal imaging technology. In particular, its Eagle Attack Thermal Imaging Camera (TIC) has generated international interest and arguably sets a strong benchmark for its quality, design and cost. 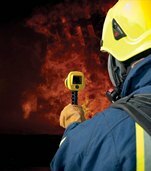 Hereford & Worcester Fire and Rescue Service (HWFRS) (made up of Hereford, Worcester, Kidderminster, Bromsgrove, Malvern, Droitwich, Evesham and Redditch services) attend approximately 9,000 emergency incidents each year, many of which require the use of thermal imaging equipment. With existing equipment coming to the end of its serviceable life, HWFRS decided to review the thermal imaging market to ensure they had the latest expertise and technology. A range of cameras from suppliers on the Consortium Framework were trialled and tested at the Services Hot Fire Training facility. Fulfilling a set of strict requirements involving cost, durability and practicality, the Eagle Attack was chosen, securing Scott safety another successful contract. Scott Safety understands that TICs are vital to allowing the Fire and Rescue Services to quickly and safely respond to emergency situations and therefore the necessity of a functional, reliable and up to date product is paramount. The Eagle Attack thermal imaging camera fulfils these requirements and delivers the performance, quality and durability that modern day fire fighters demand. Weighing only 765 grams, the Eagle Attack is one of the lightest and most portable cameras in the industry. Designed for ease of use, the single button operation enables the device to be switched on within two seconds and its ergonomically designed handle is comfortable to hold. Its high resolution and anti-glare display provides users with exceptional image quality and functionality not normally available in lightweight imagers. The innovations in design and production of the Eagle Attack have also allowed for economies in the purchase price too. With its low unit cost, Fire and Rescue Services are able to afford at least one camera for each fire appliance which will undoubtedly improve efforts in search and rescue attempts.